Early-onset Alzheimer’s took his mother and grandfather. Now it’s taking Bruce Vincent, just 48. He’s lost a lot already, but not his calm or courage. Confused about whether he had changed the light bulbs, Bruce Vincent checks them at his family’s grocery store, Vincent’s Country Store, in downtown Westminster, MA. Suffering from Alzheimer’s disease, he has entered a study at Brigham and Women’s Hospital. First in a series of occasional articles about the Vincent family’s struggle with Alzheimer’s disease. 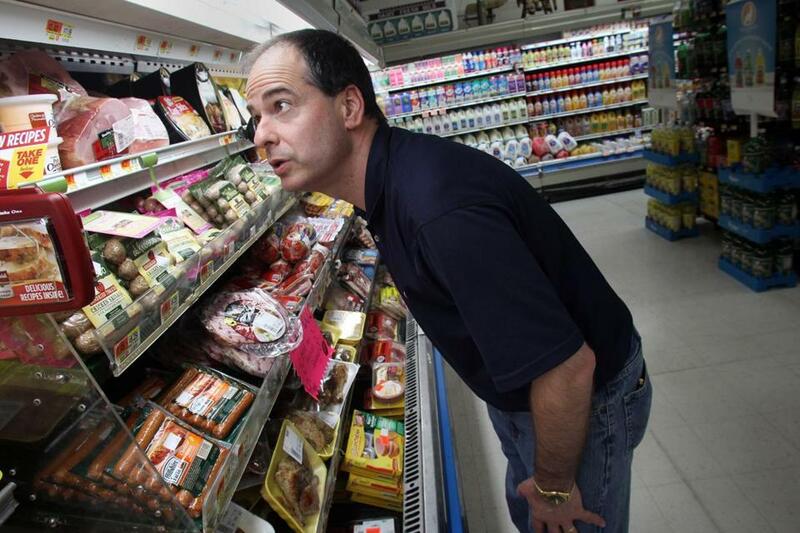 WESTMINSTER — Bruce Vincent works his way up and down the aisles of the grocery store he has owned for two decades, methodically unpacking crates of food, stocking shelves, and breaking down the empty cartons. Midway down aisle 2, Vincent hesitates, unsure wherethe fudge-coated peanut butter cookies go. The redesigned package throws him, so he tucks them amid crackers on the top shelf and continues down the row. On closer inspection, Vincent has left behind a trail of similar mismatches, which his 26-year-old son, Brian, now the boss, wearily but discreetly fixes. Used to be, the elder Vincent would gently correct the mistakes of his son, who started sweeping floors and stocking shelves at Vincent’s Country Store when he was 10 years old. That was before Alzheimer’s disease. At 48, with a face still wrinkle-free, Bruce Vincent is starting to forget things he has long known — how to stock shelves, how to make change at the cash register, how to read a digital clock. A casual acquaintance probably wouldn’t notice anything amiss, because he often obscures his forgetfulness with quick one-liners. But his family sees it. Just last year, Vincent was named businessman of the year in this Central Massachusetts town of about 7,000. Now his wife and three grown children are confronting uncomfortable, agonizing decisions no family should face so soon: Is it safe for Bruce to drive? Will he have to stop working at his own store? The Vincent family has been plagued by an especially cruel, inherited form of Alzheimer’s disease that strikes at an early age. Bruce Vincent’s mother, Theresa, was diagnosed at 43 and died about a decade later. Her father, George, made it to 59. George’s father, Omer, also died young, at 56, with an unknown dementia. The early-onset form is rare, accounting for only about 2 percent of the estimated 5 million Americans with the disease. Still, researchers have begun studying Vincent and other families with this inherited trait in the belief it may help them understand, and ultimately tame, a disease that has defied treatments. Bruce and Cindy Vincent — high school sweethearts since the ninth grade — dread the thought that any one of their three children could be Alzheimer’s next victim. There is a 50-50 chance that the Vincents’ children — Brian, Jeff, 27, and Danielle, 20 — inherited the disease-causing gene from their father. None has been tested, although Brian and Danielle are considering it. Their mother, who has become the rock of the family, doesn’t want to know whether they have it. “I think it would break my heart,’’ she said. The first time Bruce Vincent heard the word Alzheimer’s was when his mother was diagnosed with the disease. Then 43, she had crashed her car and was hospitalized. Bruce and Cindy were 19 years old, and had just gotten married. It was 1981. After the car crash, Theresa managed to hold on to her secretarial job for about a year. She was let go after she got lost several times at work and was found wandering around the large office building. With Bruce and Cindy expecting their first child, a former co-worker of Theresa’s cared for her until her night wanderings exhausted both friend and family, and she was placed in a nursing home. Yet the fear that Bruce might one day follow in his mother’s footsteps was held at bay, in part because he didn’t realize as a young newlywed that the disease ran in his family. By 1998, Cindy Vincent noticed that her husband, then 36, seemed to be getting forgetful. It was little things, a conversation they had had earlier in the day, or blanking on an errand he was supposed to run. Maybe it was nothing, she thought. But given his family’s history, they decided to have Bruce tested for a gene that signals an increased risk for the common form of Alzheimer’s. The blood test came back negative. But the memory problems persisted and seemed to get worse. During a Caribbean cruise to celebrate the Vincents’ 25th wedding anniversary in 2006, Bruce kept forgetting what room they were staying in, and he worried about finding his way back from the bathroom when they were lounging on deck. Finally, in 2008, the couple sought out a neurologist and learned that Bruce had not been given the correct blood test in 1998 that could detect his family’s type of Alzheimer’s. The new test came back positive. Cindy remembers getting a phone call from the neurologist. Cindy started sobbing on the phone. Later, still crying, she gently broke the news to her husband. Bruce, always unfailingly upbeat, remained calm. “He said it’s going to be OK, everything is going to be fine, we will deal with it,’’ Cindy said. That night, he went to a Red Sox game with a friend. At first, Bruce seemed to hold up pretty well, still able to run the store. But in recent months, the decline has hastened. He has been taking Aricept, a medication designed to slow the progression of Alzheimer’s symptoms, since he was first diagnosed. But the medicine has lost its effectiveness, something his neurologist advised would happen after roughly 18 months. Common words elude him. He tries to come up with alternative phrases, but often resorts to saying “thing’’ in place of the word he can’t remember. Increasingly, he has difficulty joining in conversations. “It takes a while for my mouth to catch up with my brain,’’ he said. In August, his doctors recommended that Vincent take a test to ensure that his skills were sharp enough to continue driving. Among the questions that stumped him was one that required him to draw a picture of a clock showing 11:20. Vincent, who drove himself to the test, failed the exam and was advised by the testers to stop driving. He has not driven since, and even agreed — after much lobbying from Cindy — to sell his beloved Audi to his brother. But the lifelong car enthusiast, who reveled in taking his sons to auto shows, has yet to surrender his license. Each time, Cindy reminds him of what the test officials advised. Each time, Bruce reminds her that he knows other Alzheimer’s patients who still drive. Or that he once passed a safety driving course. The issue infuses nearly every conversation, every errand. “I feel I am still 95 percent good to drive,’’ Bruce confided recently. As Bruce’s symptoms became more noticeable, he and his family chose a very different path than the secretive one of his mother, opting instead to go public. They shared their family secret with a local online magazine, Community Vine, and in September plastered the front of their store with fliers seeking donations for the Alzheimer’s Association Memory Walk. Vincent was always the first to donate to local sports teams. He handed out countless hot dogs and sodas from his store on Memorial Day, and eagerly volunteered for the Dunk Tank to raise money for local charities. His customers returned his generosity — the family raised more than $9,000 for research and related work. There is no screening test to detect who will develop the common form of Alzheimer’s, but there is a blood test that can identify the three gene mutations believed responsible for the early-onset variety. Patients with any one of the mutated genes will develop Alzheimer’s, generally before age 60. With that certainty, researchers recently launched an international study of families like the Vincents to track changes over time in their blood, brain, and spinal fluid before they fall visibly ill.
Scientists think that in both forms of the disease, Alzheimer’s begins to damage the brain years before memory lapses and other symptoms appear. Their aim is to translate brain and blood changes they find in early-onset patients into a test that would screen for the more typical form of the disease, allowing patients to be detected in the silent early stages. A reliable test might enable physicians to prevent or delay dementia with drugs or other therapies, in much the way they prescribe cholesterol-lowering drugs to stave off heart disease. Scientists believe that in both early-onset Alzheimer’s and the more common form of the disease, abnormal proteins known as beta amyloid form sticky clumps in the brain, but it’s not known why they accumulate in some people earlier than others — nor is it clear whether these clumps are a cause of the disease or a byproduct. Potential treatments would attack or seek to prevent the buildup of these proteins. “The Vincents are an incredible example of why we can’t wait,’’ said Dr. Reisa Sperling, a Brigham and Women’s Hospital neurologist who leads the Boston arm of the study. Her eyes tear up when talking about the Vincent family. The researchers told Bruce Vincent that it’s unlikely they will find answers in time to help him, but that they may be able to help his children. The Vincents didn’t need any more convincing. Over two days in September, Bruce officially enrolled in the study, allowing Sperling’s team to scan his brain, tap his spinal fluid, take detailed notes about his family history, and conduct memory tests. Although Vincent is already showing symptoms, researchers want to track how his disease progresses. Sperling hopes the Vincents’ three children will consider enrolling in the study. Volunteers aren’t told whether they carry the mutated genes, but the three have not yet decided whether they will participate. Danielle Vincent was a high school senior when her father was diagnosed two years ago. Since August, when doctors recommended that her father stop driving, Danielle, a free spirit who has yet to decide on a career, has been getting up at 5:30 a.m. four days a week to drive him to work at the store. She goes home to sleep a few hours before going to work at her mother’s gift shop, next door to the grocery store. She describes her father as “probably the nicest person in the entire town,’’ and says she already misses him. Danielle and her brothers recently went to a genetic counseling session, a prerequisite to having a blood test to confirm whether they also carry the Alzheimer’s genes. The counselors told them that before they take the test, they should buy life insurance, so that they would not be shut out from that option, should their tests confirm the worst. Danielle is having trouble getting past step one. “I’m not going to get life insurance at age 20,’’ she said. Jeff Vincent, 27, a part-time Holden police officer who recently married, said he has no interest in knowing his “expiration date.’’ Neither Jeff nor his siblings have children of their own yet. Bruce Vincent says he knows his illness has upset his children. He talks about being “not much like a father’’ anymore. He can sometimes see on their faces their frustration with him. “We used to be like best friends,’’ he laments. But after repeated problems ringing up customers’ orders, the family decided several months ago that he could no longer work the cash register. He also has stopped ordering stock and balancing the books, after multiple instances of over-ordering some goods and shortfalls of others. Cindy Vincent and her children say they know the time will soon come when they are forced to insist that Bruce stop working entirely. She confesses when she is alone to more than a few “ugly cries’’ over the issue. The couple’s middle child, Brian Vincent, whose raven hair and ivory complexion resembles his father at 26, has gradually taken over management of the store. “If I can help my parents and honor them, it is the best in life to give back,’’ he said. He comes home exhausted, and it is then that he has time to dwell on his underlying fear. But it’s not so much the possibility that he, too, may have inherited the disease. “I guess I’m afraid for my mother more than for myself,’’ Brian Vincent said. For more information: Alzheimer’s Association Massachusetts and New Hampshire Chapter, 24/7 Helpline 800-272-3900, or their website.